Earlier this week, I joined officers from the Metropolitan Police on patrol in Islington and saw first-hand how they go the extra mile to keep the streets of the capital safe. 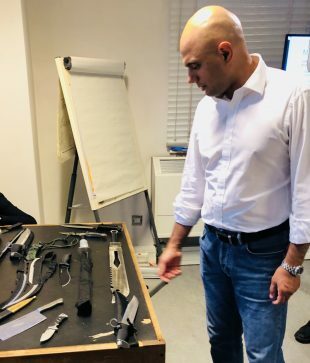 I was shown a collection of dangerous weapons they had seized including zombie knives, machetes, samurai swords and flick knives - all of which have the potential for devastating consequences. As a father, it worries me how young people are able to get their hands on weapons which can cause so much harm. This is why we are taking action today to tighten the law. The Offensive Weapons Bill introduces tough new measures which make it harder for people to possess and purchase these dangerous weapons. We are making it a criminal offence for a knife bought online to be sent to a residential address. Anyone buying knives online must also prove they are over 18 and retailers must ensure they make sufficient checks. In addition, anyone who has weapons such as zombie knives, knuckledusters and death stars will be required to surrender them to the police. But it is not just knives I want to tackle. I have been shocked by the number of acid attacks and I see no good reason to carry it. Under measures in the Bill, police will be able to confiscate it and make an immediate arrest. We’ll also ban selling the most dangerous acids to under-18s. The nature of violent crime has changed and these new measures ensures the net is closing around violent criminals. As Home Secretary, I will be relentless in ensuring our streets remain safe.